March to the Arch with WZND this tournament season! WZND wants to send you and a friend to St. Louis with tickets and a trip to the Missouri Valley Conference Tournament! 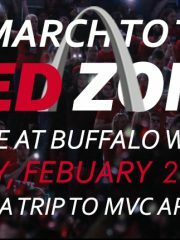 Join WZND and the RedZone at Buffalo Wild Wings on Main Street in Normal, on February 21st from 5 p.m.-7 p.m. for your chance to win tickets and a trip to Arch Madness! Get entered in to the drawing by coming to Buffalo Wild Wings, and participate in games for more entries. The giveaway will happen during a live RedZone with Andy and Hector at 6 p.m. Winner must be present in order to win tickets and trip to St. Louis. Listen in to WZND starting Thursday, February 7th for your chance to be entered early. Also, follow WZND on Facebook, Twitter and Instagram for more entry opportunities! March to the Arch with WZND and Go Redbirds!